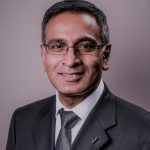 THE APPEARANCE OF THE NECK IS currently one of the main points of interest of the aesthetic field; there are many changes to this area with ageing that require addressing with a multi-modal approach. In youth, the neck is clearly defined with smooth non-creased skin, visible structures of the medial and lateral borders of the sternocleidomastoid, and posteriorly the borders of trapezius with hollows at the suprasternal notch and supraclavicular areas1. During the process of ageing there are visible changes in the skin texture, underlying platysmal muscle changes, and volumetric changes in the fat layers. Platysmal bands: the platysma contracts with age which causes blunting of the sharp jawline and vertical neck bands in the area. Group 3: as Group 2 with necklace lines, platysma hypertonicity, and advanced skin laxity/sagging. In treating these different groups, we propose a multi-modal approach using 32 mg/ mL of stable hybrid cooperative complexes of high and low molecular weight hyaluronic acid (Profhilo®, IBSA Farmaceutici Italia, Srl) alone and in combination with botulinum toxin type A. The neck was injected according to the BAP Neck Technique with 2.0 mL of Profhilo® with a month between the two treatments. 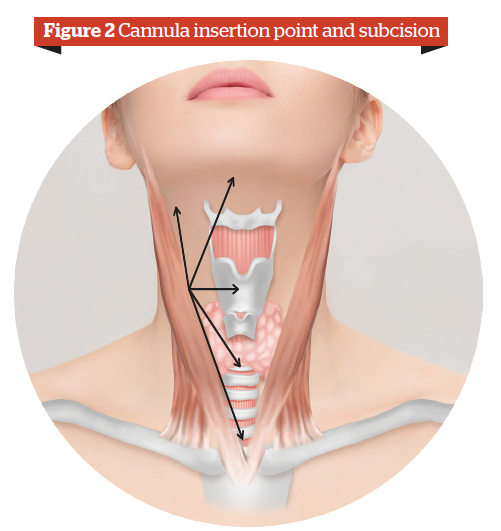 The 10 point BAP Neck Technique was developed in order to provide reproducible points of injection and to standardise these points irrespective of variations between patients and ensure that the injection points avoid potential injury to vital structures (Figure 1). 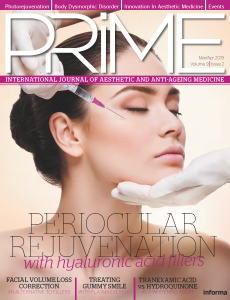 At the first session, a total of 50 IU of botulinum toxin was injected into the platysmal bands and horizontal lines (if present) using the following protocol: on the platysmal bands, 2 U per point was injected every 1–2 cm in a relaxed state with a subdermal bolus technique. On the horizontal wrinkles, 1–2 U per point was injected every 1–2 cm using an intradermal bolus technique in the mandibular platysma (Nefertiti Lift)6. 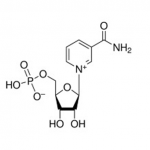 Then two 2.0 mL doses of Profhilo® were injected at day 15 and day 45, respectively. 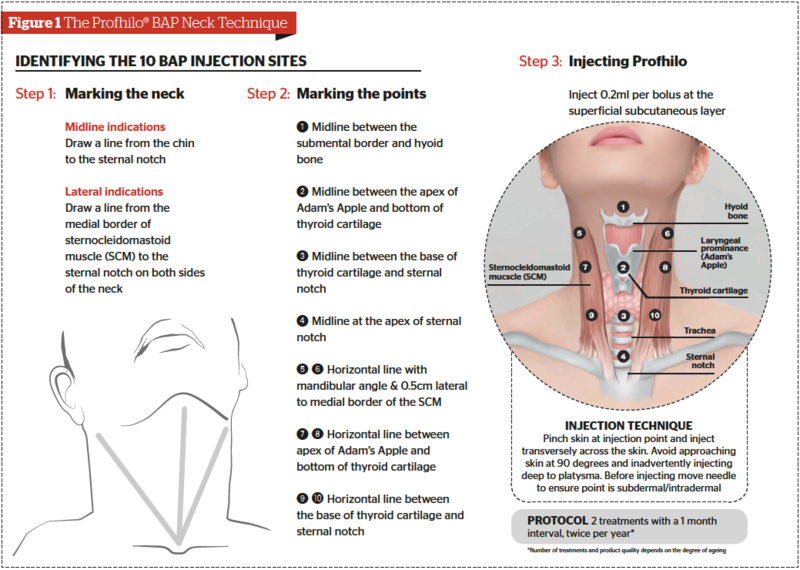 Profhilo® was injected according to the BAP Neck Technique (10-point injections of 0.2 mL) (Figure 1). Personal experience We tested these three techniques with a total of 20 patients per group. All patients in these groups experienced a continuous, gradual effect with a significant clinical improvement in neck ageing. The treatment was well tolerated and the patients were very satisfied with the overall aesthetic outcome and the duration of the results. Figures 3–5 demonstrates before and after examples from each group. Thermally stabilised natural HA with a duration similar to a weakly cross-linked gel. Favour a remodelling of the extracellular matrix in terms of elasticity and support7. Botulinum toxin type A is a frequently used tool within the therapeutic spectrum for the treatment of hyperkinetic facial wrinkles, including those in the areas of the mouth and neck8. With ageing, the platysma muscle becomes hyperkinetic and hypotonic which results in vertical muscle bands and horizontal neck lines. The platysma muscle stretches the skin of the neck downward and, with the action of the depressor anguli oris, pulls down the lateral corners of the mouth. Botulinum toxin can be used on its own or in conjunction with other procedures. It is particularly useful in patients with platysma muscle hyperactivity6. Therefore, the combination treatment with Profhilo® and botulinum toxin type A can be considered a good multi-modal approach to improve the overall quality of the neck. In aesthetics there is an increasing interest in treating the ageing neck; the youthful neck includes clear skin texture and tone without laxity. The ageing process involves loss of volume, increased skin laxity, worsening texture, and wrinkling. The aesthetic treatment of the neck is of crucial importance in the overall rejuvenation programme. This multi-modal approach improved the aged skin of the neck, reducing skin laxity and increasing elasticity and consistency of superficial soft tissues. Based on this preliminary experience, botulinum toxin type A and stable hybrid hyaluronic acid cooperative complexes when used in combination are effective and safe.